When facing the prospect of prosthetic surgery, many patients tend to wait, especially if they are still young. Fear of the operation itself, of the possible complications, the fact that rehabilitation may be rather lengthy (having to give up work and compromise one’s social life), and fear of an incomplete recovery of the joint are the reasons why people generally tend to put off having the operation, preferring to “carry on” and putting up with a low quality of life. However, it is good to know that intervening quickly is essential for halting disease progression. In fact, as is known, once arthritis has developed, it tends to become chronic and progressively deteriorates: a simple alteration of the cartilage covering the joint can progress to the formation of ulcerations of the cartilaginous tissue over time. These areas become larger until the bone itself starts to wear out. In addition, if not rectified at the right time, the other knee can also become diseased and two operations becomes necessary rather than one. Therefore the key word is “timeliness”. By intervening as soon as possible, you will be able to undergo the least invasive approach. A multi-step approach allows the patients’ needs to be met, with excellent results. How does it work? The aim is to use conservative approaches where possible, which preserve the patients’ bone. If the arthritis is not serious, non-surgical techniques can be used. If only part of the joint is worn out, mono-compartmental arthroplasty is carried out, which involves implantation of a mini-prosthesis. This means that the patient can undergo a quicker, less invasive operation and less rehabilitation is required. You have chosen knee arthroplasty and have fixed a date for the operation. While waiting, you can help make sure that the operation goes smoothly. If overweight, now is the time to do something about it. Every kilo lost before the operation can significantly lighten the load on your new joint. Moderate exercise before the operation can help to strengthen the muscles, allowing faster mobilization after the operation. It is also advisable to stop smoking, particularly before the operation, so you should seriously attempt to stop. This will permit a faster recovery. Prepare a list of medicines that you take regularly. Your doctor will be able to tell you which ones you must stop taking before the operation and how much in advance. If available, bring the clinical records of previous admissions with you. If you suffer from allergies – for example to metals like nickel or chromium or if you are allergic to medicines – tell the doctor at the hospital and bring your allergy passport with you, so that therapy can be organized accordingly. To guarantee that the operation goes smoothly, your doctor will tell you exactly what to do. As a general rule, from midnight the day before the operation, you must not eat, drink or smoke. If you are on medication, the anaesthetist will decide what medicine you can continue to take before the operation. Which type of anaesthetic will I be given? Knee arthroplasty can be carried out under either local or general anaesthetic. Often the operation is performed using «spinal anaesthesia», that is to say that the patient is conscious but cannot feel pain. The field of view is closed off by a special curtain. During a general anaesthetic, on the other hand, the patient goes into a deep sleep. Also in this case, no pain is felt. In both cases, the anaesthetist will keep you under observation. Knee arthroplasty is one of the surgical operations with the highest success rates. Despite this, every surgical operation has certain risks. General surgical risks such as blood clots are treated with anticoagulants during the operation. In addition, for a certain amount of time after the operation, you must wear elastic socks and take anticoagulants. Specific risks also exist which relate specifically to knee arthroplasty. These include infections, damage to the blood vessels and to the nerves, or bone fractures during the operation. However, these complications are rare thanks to the constant improvement of medical treatment and the vast experience of the physicians who perform routine operations. The joint is found under several layers of muscle and is surrounded by a very resistant capsule, which is carefully opened at the beginning of the operation. In this way, the surgeon can easily access the joint. 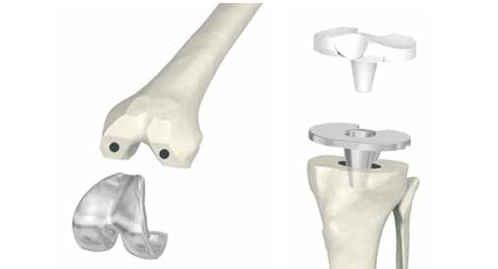 The worn-out joint surfaces of the femur and the tibia are removed using templates and special resectioning blocks, so that the remaining bone perfectly fits within the implant components. The surgeon initially uses trial implants to test the stability and the positioning of the prosthesis. The final implant is then inserted. 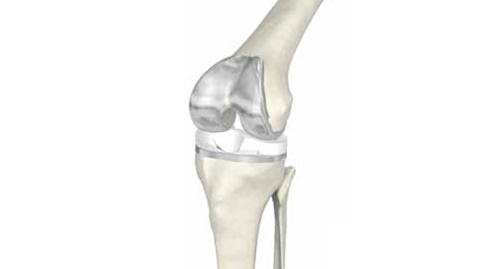 The polyethylene substitute for the meniscus is positioned over the metal tibial component. 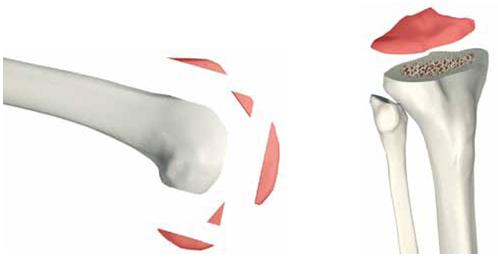 Based on the level of knee damage, as a final step, the surface of the patella facing the artificial joint is replaced. Finally, one last check is performed to assess mobility and the wound is then sutured. In general, knee replacement surgery lasts for 1-2 hours. However, the field of medicine is constantly evolving. Over the last few years, new surgical methods which are less invasive have yielded positive results. The aim of mininvasive surgery is not to disturb the soft tissues. The aesthetic effects of a smaller incision is a secondary aspect. The main advantage is to save muscle and the ligaments and tendons which can be found underneath the skin surrounding the joint: these are not cut but are retracted. In general, the advantages of this approach include less blood loss during the operation, quicker healing, less pain and a quicker resumption of daily activities. For your safety, after waking up from the anaesthetic, you will be in a recovery room where the staff will look after you, closely monitoring your progress. This is perfectly normal. Usually after a few hours you will be transferred to a bed on the ward. The operated leg will be supported by a brace or placed over a cushion. A drain will eliminate the secretions from the wound, preventing the formation of hematomas. A few days after the operation, the drainage tubes will be removed. You will be given painkillers to keep the pain to a minimum and to help you rest and recover physically. After the operation you must continue to take the anticoagulants to prevent the formation of blood clots. In addition, after the operation, some patients must wear elastic socks. These help to prevent the formation of blood clots. Much like clinical conditions, rehabilitation also varies from patient to patient. In general, you will be able to get up with the help of staff the day after the operation and you can also begin to walk. To guarantee that your knee functions perfectly from day one, physiotherapy is vitally important, together with your active collaboration. A few days after the operation you will be assessed and will follow a physiotherapy program. The physiotherapist will explain which movements should initially be avoided and how much you can use your leg. The stitches will be removed 10-14 days after the operation. You will soon go home or be transferred to a rehabilitation centre where you will learn how to resume a normal daily life. Suggestions for living with your new joint. You are finally going home! It will take four weeks before you can stop using your crutches and return to an active life. Until then, you must take care to do all that is necessary so as not to tire your new joint excessively and to help the wound to heal quickly. It is absolutely essential to avoid sharp movements. Flat, robust shoes with good soles will help you stay balanced and will relieve the load. You must also avoid carrying heavy objects. If you must carry weight, divide it between each side of the body. Be aware of potential obstacles, stones and slippery surfaces in the winter. Adopt a healthy diet and pay attention to your weight. If you notice problems, such as persistent swelling or redness around the wound, a considerable loss of blood, a smell coming from the wound, or intense pain, you must see a surgeon. You must always attend follow-up visits, 1 month, 3 months, 6 months and 12 months after the operation, then once a year. In this way, potential problems related to the implant can be identified in good time, thus preventing any damage. The longevity of the implant depends on the surgeon’s skills, the quality of the implant and very much on your contribution. Take great care of your prosthetic knee and avoid straining it. Following are several important pieces of advice and useful suggestions which will help you to face life with your new joint. Go for short walks every day, using crutches: use one crutch on each side and position them slightly in front of each respective foot. Support yourself with the crutches, slightly bending your elbows. Make sure you support your weight with your hands. Avoid irregular surfaces and wear flat, robust shoes. Put weight on the operated knee exactly as explained in the hospital. One step at a time, placing the foot of the healthy leg on the step first. Keep the crutches on the step below. Now move the operated leg, together with the crutches, and bring it onto the same step as the healthy leg. Place the crutches on the step below. Go down the step with the operated leg first. Shift your weight onto the crutches. Then bring the healthy leg onto the same step as the operated leg. The hips must always be higher than the knees. If possible, use a chair with armrests to help you when you get up. To sit down, walk backwards until your legs touch the chair. Extend the operated leg forward and support yourself using the armrest, carrying your weight on the arms and the healthy leg. Lower yourself onto the seat. To get up, push down hard on the armrests and shift the weight onto your arms and the healthy leg. Extend the operated leg forward and gently push yourself up, using your arms. Make sure you are balanced before taking hold of the crutches. Based on your height, completely extend your leg in front of you before sitting. A handle is useful for support. Do not take a shower until the wound has completely healed. Get into the shower with the healthy leg. A handle or bench can help getting in and out. Always use an anti-slip mat in the shower and place one in front of the shower too. Use a sponge with a long handle in order to wash your legs without having to bend over. Get out of the shower with the operated leg first. Dry the wound without scrubbing. Take a bath only when you feel truly ready. It would be useful to place a bench or a handle in the bath tub. Slowly walk backwards until you touch the bed. Place the crutches on the side and lower yourself onto the bed, helping yourself with your arms, slowly sitting down and shifting the weight onto the healthy leg. Slowly turn and lift the operated leg onto the bed, helping yourself with two hands. Then move the healthy leg. The correct sleeping position is on the back, with the legs slightly apart. To get up, place the healthy leg on the floor first. Lift the operated leg, helping yourself with two hands, stretch it forwards and balance yourself to get into position. If possible, ask for help initially. Alternatively, it is possible to use special accessories. After acquiring a sufficient level of control and after having reacquired strength and sensitivity in the legs, you will be able to drive again. This usually takes one month. Sexual activity can be resumed as soon as you feel ready. Avoid bending the knee more than 90 degrees. Your partner must not put his/her weight on the operated knee. Knee arthroplasty allows sports to be resumed. Non-impact sports can be resumed 3 months after the operation, while impact sports which involve jumping and running can be resumed after 6/8 months.